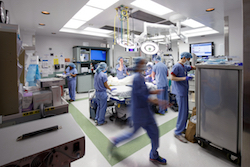 The UCSF Endocrine Surgery and Oncology program delivers state-of-the-art care surgical care, complemented by a strong clinical research enterprise geared towards discovering effective therapies to treat thyroid and other endocrine cancers. This approach is particularly important for patients who have exhausted conventional therapies. Our lab research is focused on gaining a better understanding of thyroid cancer biology, developing and improving diagnostic and predictive tests, and finding novel and innovative treatments. Endocrine cancers, those affecting the thyroid, parathyroid, adrenal gland and endocrine pancreas, are diagnosed in more than 35,000 people in the U.S. annually. The vast majority of these are thyroid cancers, a disease that strikes three times as many women as men, and is now the fastest growing cancer diagnosis in the U.S.